The Salesforce Advanced Developer Certification is intended for Salesforce experts who specialize in developing custom applications using Apex and Visualforce, managing the development lifecycle and environments, and writing and executing comprehensive test plans. The Advanced Developer certification, also called DEV-501, is not an exam for a beginner. By passing the Advanced Developer certification, it ensures you have a working knowledge of the Salesforce platform, beyond the point of an administrator or a point and click developer. An Advanced Developer is an expert on the Force.com platform, including Apex, Visualforce, SOQL, deployments, and more. When registering for the programming assignment you will schedule your essay exam. Make sure you schedule it with enough time to finish your programming assignment prior to taking the essay portion. 3–5 short-answer essay questions directly related to your implementation programming assignment. Essentially, you will need to justify your decisions. This will be your explanation of your work and it will be reviewed in conjunction with the programming assignment. 60 minutes to complete the proctored exam. Write quickly as I found the 60 minutes comes and goes very quickly. Focus on the important information. I passed my Salesforce Advanced Developer certification on the Spring ’13 release. By the time I attempted this certification, I had well over a year and a half of intense Apex and Visualforce experience. On top of that, I was an avid member of the Salesforce StackExchange. I basically lived and breathed the platform for a long time before even attempting this certification and I highly suggest the same for anyone who may attempt it. You absolutely must need to understand the intricacies of the platform. I did not find the multiple choice exam to be too difficult. In fact, it was much easier for me than some of the other exams. Keep in mind, I am very technical by nature. An exam with several questions related to syntax and proper technical methodologies was easier for me. It reminded me more of the Java certification than any other Salesforce exam I had taken. The programming assignment and the essay were more of a burden of time than anything. Working 50+ hours a week already and then trying to cram in ~40 hours during a month’s time frame was rough. I won’t get into anything specific about the assignment, but I will say that it wasn’t anything overly complicated and with anything Salesforce related, it was very well documented. There is no ambiguity and the team is not out to trick you. You are even allowed to submit a case to ask for clarification if necessary, although I did not have that need. Note: These are just some things to focus on, there will be questions outside of these particular topics. Focus on the Exam outline in the Study guide. It is important to understand how the Salesforce certification process works and how Salesforce in general works. Salesforce has 3 releases a year, Winter, Spring, and Summer. Each release adds new questions to the exam. From my experience, new features are typically tested more heavily. Mark every question you aren’t 100% certain on. Remember, you only need 51 questions correct to pass, so if you only mark 10, you are good to go! Eliminate any ridiculous answers from the multi-select options. Remember, you only need to select the specified amount of correct answers. Read each question carefully. While I don’t think there are trick questions on the test, the questions do sometimes come in paragraph form and it is crucial to have an understanding of the entire question before you answer. Take your time. You have more than enough time to finish this exam. Don’t be surprised if you finish with half of the time left. Utilize that time to review and ensure you selected the answers you intended. Comment your code more than usual. I am not a fan of comments everywhere as I believe in the concept of writing your code clean enough that you can just read it and understand what it does. However, with this being a one off assignment that will be graded by someone going line by line through your code, it doesn’t hurt to explain exactly what you are doing. Specifically, it doesn’t hurt to point out your reasoning for doing something a specific way to make it easier on the reviewer to quickly follow your line of thought. There are several correct ways to do everything, so guide the reviewer down your path. Watch for governor limits. Salesforce is on a multi tenant architecture. It is crucial to your org as well as every other org on the system to be fast and not contain anything that could bog down the system. I can almost guarantee you that if you written vastly inefficient code that you will fail this exam. Bulkify everything. Your programming assignment will give certain amounts of objects your application should have to work with. You need to make sure your application can handle those requirements. To do that, you will need to write code that handles bulk processing properly. You will also need to unit test those bulk processes with larger sets of data. Unit test everything! Unit test everything! Unit test everything! I said that three times because it is that important. I simply can’t stress it enough. Salesforce requires 75% code coverage to deploy to production. For this exam, I would recommend 100% code coverage. Also, test the different branches of code as well! Simply hitting a piece of code isn’t enough. If you have an if statement, you need to check both conditions! Write proper unit tests! If you finish your application and you haven’t written any assert statements, you will fail! These need to be well written, well formed unit tests. Trust me, the unit tests are crucial to your success both in this exam and actual development. The only information you get at the end of the multiple choice exam is Pass or Fail. You will get a brief email indicating what you did well and areas of improvement from your programming assignment/essay. As you can see above, the Advanced Developer certification is part of the Developer tree. This means you must complete 3 Developer maintenance exams a year to maintain your certification. The maintenance exams are relatively simply, usually 10-15 questions related to the latest release. Your best bet is to read the release notes and watch the release webinar. It is important to note that even though you are required to complete an essay and programming assignment as part of the original certification process, you are only required to complete the multiple choice maintenance exam. 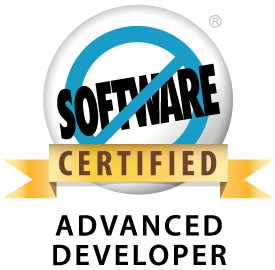 The Advanced Developer certification is one of the toughest Salesforce certifications to attempt. There is absolutely no way you will be able to pass this exam without a very thorough understanding of the platform. Specifically, if you don’t truly understand Apex, Visualforce, SOQL, and the governor limits, you will fail. It is just that simple. With all of that said, once you do get the certification you are recognized for truly understanding the platform. You will join an elite group of developers on the Force.com platform and it is definitely worth the investment. Good luck! This article is part of my Sales Certification Series. For more information on the other certifications, please check them out. I am beginner in salesforce, I have cleared Dev 401 Certification. Thank you for valuable tips. Its really very useful information. Lot of things are cleared to me now. Congrats on your cert Sameer! Good luck in preparong for the Advanced Developer certification. It is a difficult one, but with enough preparation it really isn’t too bad. I just passed the DEV-501 multiple choice. I am basically a Java programmer turned salesforce developer. I am good at programming with various technologies. but still I was hesitant to schedule the DEV-501 test, as everybody unanimously said it was soooooo tough n it is very hard to clear it on the 1st attemp..etc.. but your blog changed that perception towards the exam. Specifically the following words made me schedule the test immediately as I was already almost prepared 🙂 So, a personal thanks to you for giving me the confidence. I’ve been today putting all the info together reading trough and ready to start studying! Thank you very much for your post, it is really helpful. There is one tip that I like a lot : Unit Test everything! I heard multiple choice exam is the hardest part of 501. Planning to take it up in the next 6 months. Quick question, do you know if the exam prohibits using online architecture code? I’m most curious about including the Financial Force Enterprise Library.